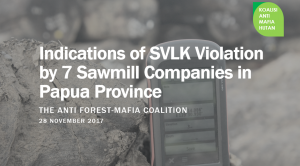 Jakarta, 28 November 2017 – The Anti Forest-Mafia Coalition files a report on seven sawmill companies operating in the province of Papua for allegedly violating both the regulations of SVLK (Timber Legality Assurance System) and international timber trade. Despite having obtained timber legality certification (S-LK), those companies were found illegally collecting processed wood from natural forest areas. The report is filed about two Timber Legality Verification Bodies (LVLK): PT Ayamaru Sertifikasi and PT TRANsTRA PERMADA. PT Ayamaru Sertifikasi is a verification body responsible for the verification processes and issuing S-LKs for the following companies: CV IH, CV MJ, CV HI, PT HB, PT DJP, and PT SE. PT TRANsTRA PERMADA certifies and issues S-LKs for PT MGM. In September and October 2017, the Anti Forest-Mafia Coalition undertook field monitoring in Papua Province and found indications of violations by companies located in Jayapura Regency. Trees were cut down in the forest of Sarmi Regency, then processed into wooden beams in the cutting area. After being processed, the wooden beams were transported via wooden rail from the cutting area to the connecting road between Jayapura and Sarmi. Timber was stacked on both sides of the road, and later picked up by trucks to be taken to sawmills owned by companies mentioned in the report. Besides direct observation, the Coalition also conducted a series of interviews that support its findings from the field. Various sources ranging from the loggers, truck drivers and their conductors (kernet), as well as government officials in Sarmi Regency, were interviewed. The information from these sources strengthen the findings that the timber harvested and processed into wooden beams in Papua’s natural forest was transferred to sawmills in Jayapura Regency, Papua Province. The sawmill companies record that the timber was harvested from community-owned forest areas (kayu masyarakat). From the sawmills, the timber is packed into containers and shipped from Jayapura Harbor. The seven companies reported for violations obtained S-LKs after undergoing a certification process that met the criteria and indicators stipulated within SVLK regulation, such as the legality of raw materials. The findings mentioned above indicate violations of SVLK. The location of the logging occurred in HPH (selective logging concession) areas within the logged over area. Logging in these areas by other parties or even by the HPH company itself is prohibited without permit from RKT (annual work plan). Administering trade for such timber does not exist in the online Administration System of Forest Resource (SIPUHH), which makes the administration process related to this timber prone to violation of law. Such logging activity threatens natural forest sustainability along with the livelihood of Papuans, especially those who depend on non-timber forest resources. The volume of timber, particularly merbau wood from the forest of Sarmi Regency, is quite significant. Field monitoring found that at least 50 trucks contains timber leaving Sarmi Regency every day, heading to Jayapura. The condition is exacerbated by the government’s lack of field monitoring. By the shifting of authority from local to provincial government after the enactment of 2014 Regional Government Law, the monitoring is supposedly undertaken by the provincial government. However, the ongoing restructuring process hampers field officers from performing their prescribed duties, while monitoring by other law enforcement agencies also not functional. The Government to evaluate immediately the process of authority transition from local to provincial government, especially in the forestry sector.